We left the campsite at 6 AM this morning to head to the Mara to see what we could early this morning. We told David, our driver, that we wanted to see rhino and a kill if we could. When we entered the park we came across a small family of hyenas. Everyone says that hyenas are nasty animals, but they actually looked kind of cute, like little puppies. There were 4 of them that were playing around with each other. Once we left the hyenas we headed deeper into the park. We started to pass herd after herd of zebra and wildebeest. The scene yesterday was just repeated, except this time we saw a few herd that were huddled much more tightly together covering the hillside in a sheet of darkness. There were wildebeest and zebras for as far as the eye could see. We continued our travels and decided to stop for breakfast. Across a large field we started to see a few vans lining up to look at something. David took out his binoculars and spotted two cats that he thought were cheetahs. We finished our breakfast and David said that the cheetahs had just killed a wildebeest. We missed the actual kill but we got there as the two animals were ferociously feeding on this large animal. We stayed there for 30 minutes watching the cats eat. 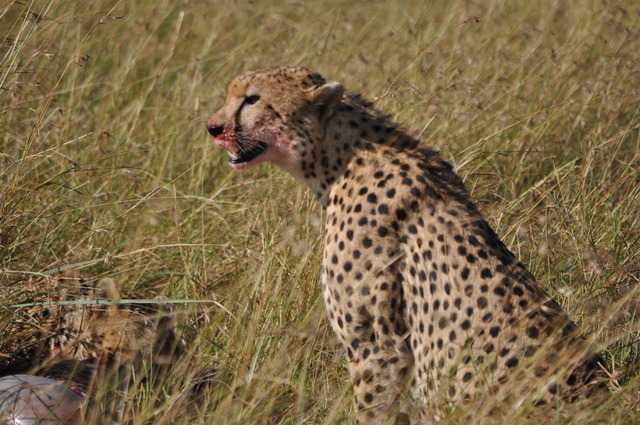 We moved the car a few times to get better angles and took some amazing pictures of the cheetahs eating. They popped their heads up full of red on their faces. They kept popping up looking to see if there were any other animals waiting to steal their kill. 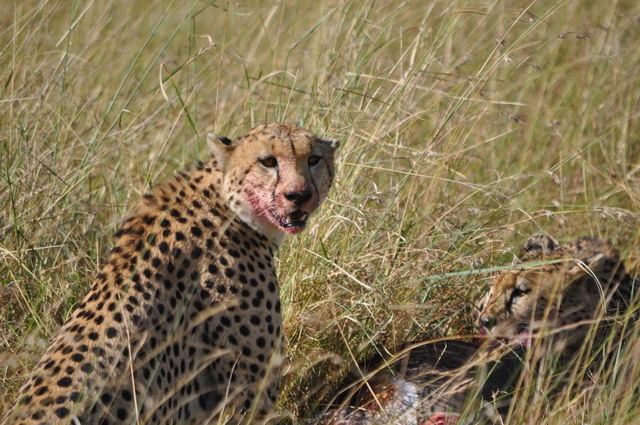 We decided to leave the kill and continue through the park and David promised we would come back to see what happens when the cheetahs were done. We headed off and spotted two female lions. We took a few pictures, but nothing like we got yesterday. Most of the family was kind of “ho hum” since we had gotten such great shots of the lions yesterday, we wanted to see more of the kill. So, about 45 minutes later we headed back to the area where the cheetahs were and they were just starting to walk off. 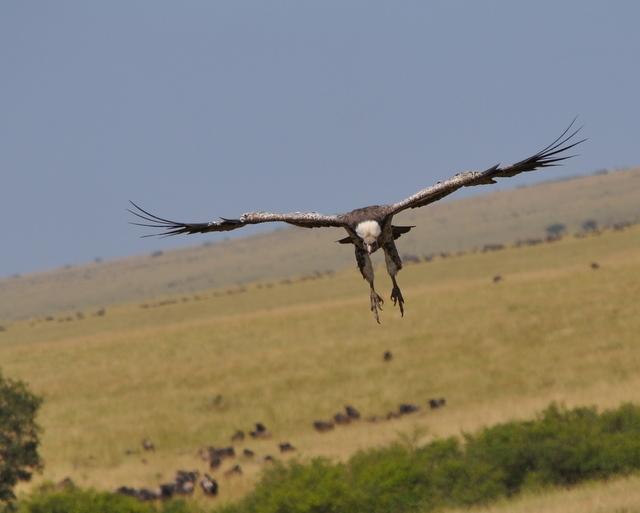 Within 2 minutes the vultures starting to circle and land on the mostly eaten carcass of the wildebeest. The cats were amazing as they dug in, but the vultures were just brutal. 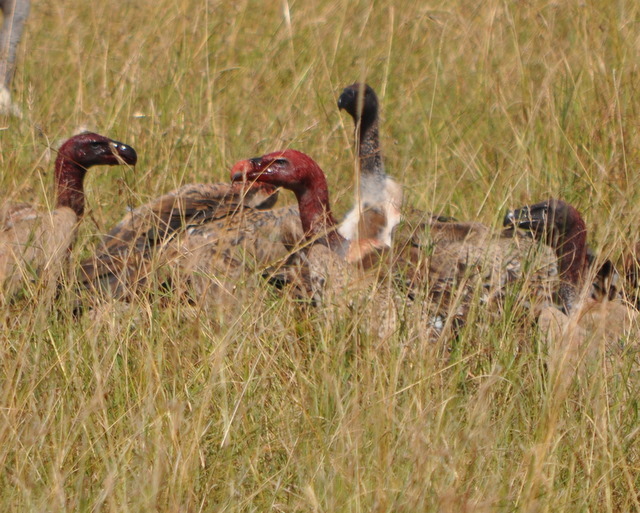 We must have seen 50 plus vultures and a handful of Mongoose Stork fly in to devour the carcass. If we return to see the animal tomorrow I am certain that it will be eaten down to the bone by the birds and the hyenas. Watching nature happen right in front of your eyes is pretty incredible. We all enjoyed watching it happen. We headed back to camp for a quiet afternoon in our tent and we are heading out for a Sundowner with the family at 6 PM. This is where they bring some drinks and some snacks and we drive to a high point to watch the sun go down and whatever animals are around. We should be back to camp by 7:30 or 8 for a nice dinner. The food at Siana Springs has been quite enjoyable, even the kids have found some things to eat. All in all this trip has exceeded my expectations and has had a profound effect on our family. I am looking forward to going home but the trip has been truly amazing. We still have two more days of game drives and a hot air balloon ride on Tuesday morning. That should be pretty cool!